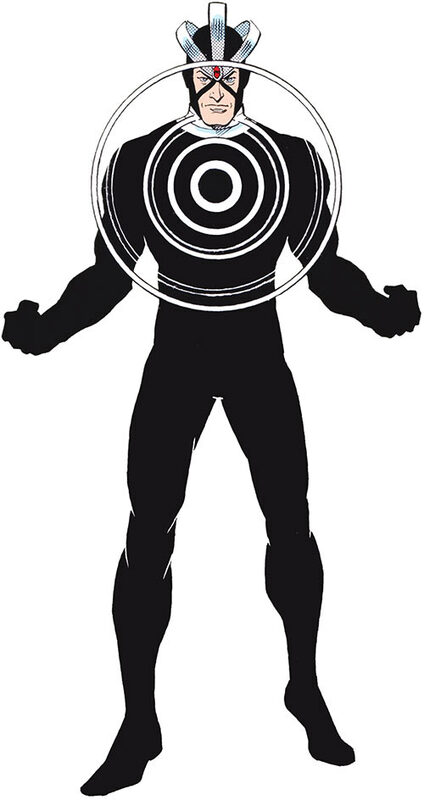 Havok is the younger brother of Cyclops of the X-Men. Like Cyclops, he has an energy blast power. 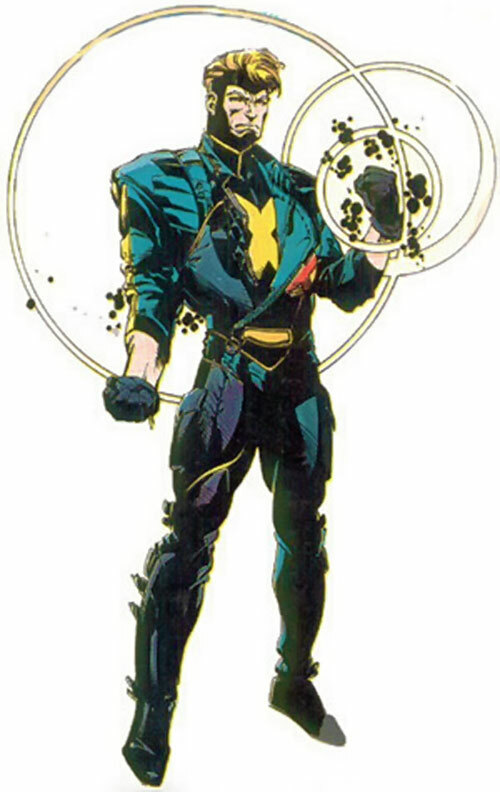 Havok first appeared in 1969, but remained a peripheral character for about 20 years, being reluctant to associate with the X-Men and the mutant cause. The character has been considerably developed since, especially after he became the leader of government superhumans team X-Factor. Over the following 25+ years, Havok has come to affirm himself as a pro-integration mutant leader. Real Name: Alexander “Alex” Summers. Known Relatives: Christopher Summers (aka Corsair, Father), Katherine Anne Summers (Mother, deceased), Scott Summers (aka Cyclops, brother), Philip Summers (Grandfather, deceased), Deborah Summers (Grandmother, deceased), Madelyne Pryor-Summers (sister-in-law), Jean Grey-Summers (sister-in-law), more relatives on his brother’s side are found in the Cyclops write-up. Group Affiliation: X-Men, previously X-Factor, Brotherhood & The Six. Base Of Operations: Previously Alexandria, VA; Diablo mountain range, AZ; X-Men H.Q., Australian Outback and the University of California, CA, currently Charles Xavier’s School for Gifted Youngsters, New York State. Height: 6’	Weight: 175 lbs. Alex Summers is an rather muscular and attractive young man. He is blond with brown eyes and has a scar vertically over his right eye. In his spare time he can be seen in ordinary, but tasteful clothes. His superheroic costume has varied over the years. 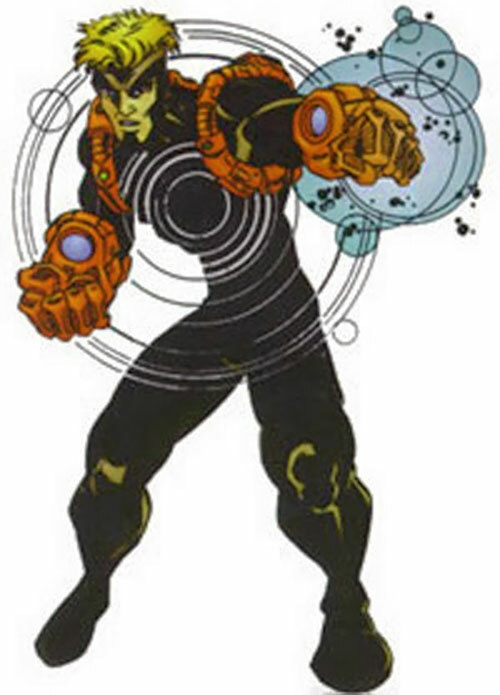 The classic Havok, who was a slimmer man, wore a full-black bodysuit covering everything except for his face, and came complete with three metal rings on his head, a ring-inside-rings symbol on his chest. When he used his powers, his whole body shone in bright light. 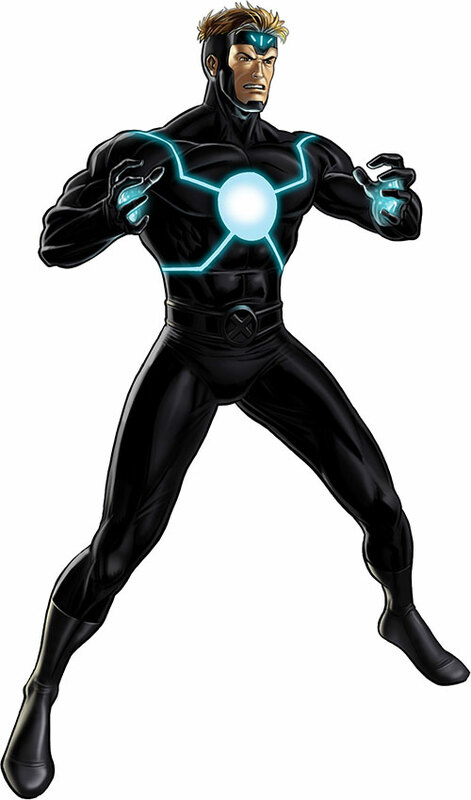 The current Havok has a more tasteful version of his old costume and has his head mostly non-covered and the chest symbol more pulsar-shaped. Furthermore, he wears a pair of yellow metal bracers along his lower arms, and on his shoulders and a yellow metal belt with a round ’X‘ symbol in black on a red background (see Illo). The three ring headpiece, when worn, is held together by a gem-like red stone on his forehead. 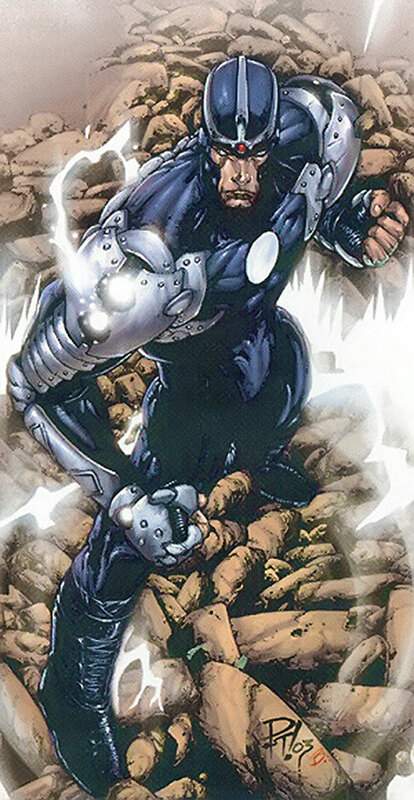 Havok’s power manifests itself as a cascade of glowing rings released from the centre of his body or as a ring-like stream directed via his arms. 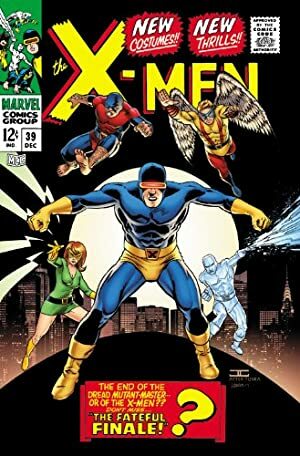 Alex Summers was originally portrayed as something of a hothead, and then particularly when it came to matters involving his ’big bro’ Scott Summers. Enemies of the X-Men and other mutants often sought to use Alex’s powers for their own gains, which made him steer away from a life of heroics. Alex was at best a reluctant hero. He preferred to live a soft and easy life far away from heroics, particularly with his loved Lorna Dane aka Polaris. But, as fate continuously disturbed his easy life and brought him up to the challenge of being a hero, he rose with each occasion. He has taken some dubious decisions, but has always had humanity’s and mutantkind’s best interests at heart firsthand. He grew in confidence and experience by life with the X-Men, X-Factor, the Brotherhood, the Six and then again the X-Men. He is today considered to be a valuable and experienced X-Man. After all this, he has since reconciled his life as an X-Man with the happy life of a family, and seems content with this. Nowadays, he even keeps his superhero costume beneath his clothing. Although by some considered to be a shallow person, Alex has much undiscovered depth. He was raised a Catholic (yeah, he knows scripture) and he is a loyal, good-hearted friend and partner. He’s also a man of rather rigid codes of behavior, much like his brother Cyclops. He’s almost as repressed as his brother, as well (a well known Summers brothers phenomenon). Naturally, he has a rather dry sense of humor. Alex’s hobbies include doing archeological digs. 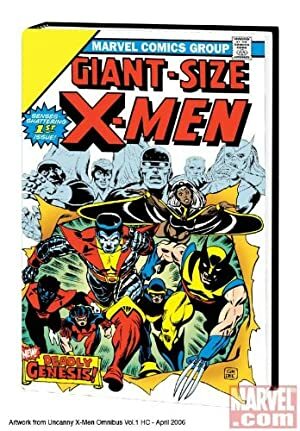 Hmmm… as with many Marvel mutant write-ups I’ll refer to Kansas Jim’s Secret History of the Marvel Universe texts. All Powers are Elementally Linked to Energy Blast (-1). Energy Absorption is only usable with cosmic energy as well as his brother Cyclops’s Optic Blasts (-1). Flash and Flight are Minor Marginal Powers (-1 each). Flight has Lack of Control (-1). Havok’s Energy Blast is actually finite, but he usually recharges the power even as he is using it. In an area where there is no source of cosmic radiation, his Energy Blast suffers from a Minor Power Burnout (-0), which will recover only when again subject to cosmic radiation. Bomb, Energy Blast and Flash cannot score any RAPs against his brother Cyclops. Alex’s Vehicles skill applies to both piloting and mechanics (+1). Area Knowledge (Washington DC), Credentials (Government, Medium), Expertise (Geophysics), Iron Nerves, Leadership. Annie Ghazikhanian (High), Lorna Dane (aka Polaris, High), X-Teams (High), Cyclops (High), Val Cooper (Low), Random (Low). Secret Identity, Mistrust (as a member of the X-Men). Metal arm bracers [BODY 08, Note: These can effectively be used for the Blocking manoeuvre]. FLIGHT SUIT [BODY 4, Misc. Advantage (By using the Suit Havok can control his Flight Power and path fully (negates Havok’s Lack of Control and Minor Marginal Power Limitations of his Flight Power; 25 pts)), Note: This flight harness effectively channels Havok’s plasma energies into propulsion units allowing him controlled flight]. Teleportation Device [BODY 4, Teleportation 6, R#2]. There was a time when Havok was much less of a hero than he is now. 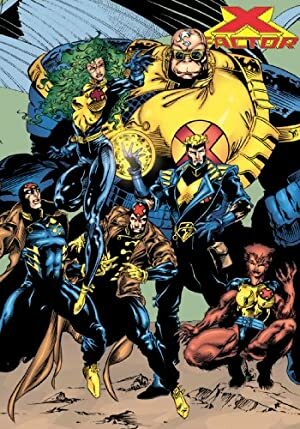 He was much less effective and heroic before gaining experience from joining the X-Men and leading X-Factor and the Six of the world of the Mutant X series. The classic Havok had 1 AP less in all base Attributes and Skills, except STR and BODY, which have always been 04 and 06 APs, respectively. He had not yet achieved full control over his plasma blasts and could only use them at their full setting (Limitations: Bomb & Energy Blast are Non-Controllable (-1 each) and only as lethal attacks (Limitations: Bomb & Energy Blast are Lethal (-1 each)). Furthermore, he also had the Uncertainty Drawback and his HPs were set at 35 HPs only. He had no Advantages and only the Connections X-Teams (High), Lorna Dane (High) and Cyclops (Low). 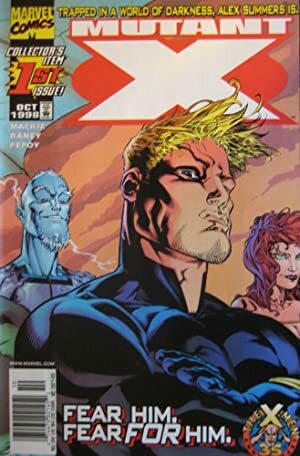 Havok, during the Mutant X series, had the same attributes, powers and skills as currently, but lacked all of his Connections, had a The Six (High) Connection and the Exile (Real Marvel Earth) Drawback. During this time, and a while after he had returned to normal Marvel Earth, he also suffered from the Drawback: MPI (Memory lapses and losses). Helper(s): Pufnstuff, Danielle Mendus, Nick Yankovec, Azrael.